Let us go now to the banquet, to the feast of the universe. The table’s set and a place is waiting; come, everyone, with your gifts to share. This song from the Misa Popular Salvadorena inspires the vision for our community meal at Trinity Long Beach. It is a vision in which all of God’s children are invited to a banquet whether they be rich or poor, have housing or are living on the streets, are friends or strangers. It is an invitation to be part of a community that sits down at a meal with one another and engages in life-transforming conversations. Trinity began its Saturday Program a number of years ago by working together with Lutheran Social Services to provide tutoring programs from children and computer classes for adults. 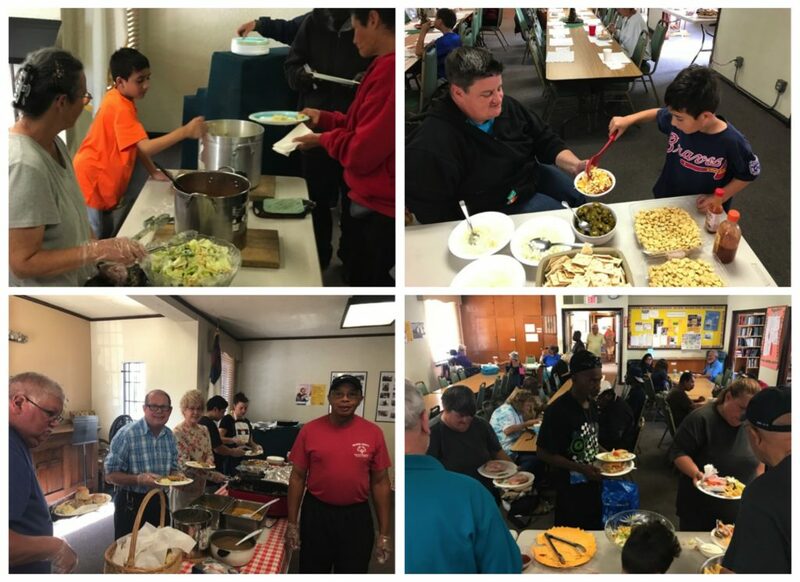 Over the years, members of Trinity would provide a meal and a Spanish worship opportunity for participants. As resources began to get tight for all of those involved whether they be financial, able and willing volunteers, or steady participants in the Saturday program, Trinity decided to try something different. We decided to expand our scope to meet a need in the community while optimizing our ability to garner volunteers and financial resources to meet that deep need — hunger for food and for community. We received a generous grant from the Southwest California Synod’s Mission and Ministry Endowment and that has helped us purchase food and supplies for the meals. We also moved our program from a weekly Saturday program to one that serves a meal once per month. The quality of our program has improved, and we have seen the number of participants grow from under 15 people to more than 75. But our community meal is more than just numbers. It’s about having one on one conversations with other human beings and we encourage listening to one another’s stories as we ourselves share stories of faith and hope. In doing so, we share the love of Jesus in this meal.